This tortellini pasta salad is loaded with flavor and hearty enough to make a meal in itself. This is one of our favorite pasta salads. 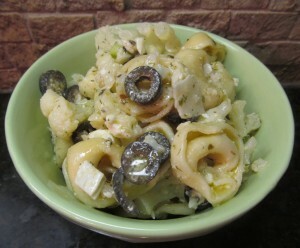 The trio of cheeses from the cheese-filled tortellini, feta, and parmesan lend a wonderful, rich flavor. The herb infused dressing is tangy and delicious and would taste great on myriad other versions of pasta salad. I can’t decide whether this salad is more Greek or more Italian. Either way, it is delicious! The original recipe called for broccoli, but I substituted cauliflower (because I had it on hand). I wasn’t sure how cauliflower was going to blend with all the other ingredients, but it was fabulous! Whichever you use, don’t skip the blanching. Just boil several minutes until the veggies are fork tender. As with most pasta salads, you can substitute ingredients and make a version specifically geared to your family’s tastes. Experiment, and see what you come up with! I hope you enjoy this! I’d love to hear from you if you have any favorite pasta salad recipes to share. As always, thanks so much for stopping by. Be blessed, and stay savvy!!! Cook’s Note: Since two ingredients require boiling, you can save time by using the same water. I boiled the tortellini first, then the cauliflower. Huge time saver! A zesty, cheesy pasta salad that is a perfect accompaniment to grilled foods! Mix all dressing ingredients well by shaking in a glass jar or with food processor. Bring salted water to boil in a medium pan. Boil tortellini until al dente; remove from pan & set aside (reserve pan of water). Bring water in pan to boil again; blanch cauliflower until just tender. Toss cauliflower, tortellini, and all salad ingredients in a large bowl. Pour dressing over; toss well. Keep in fridge until serving.